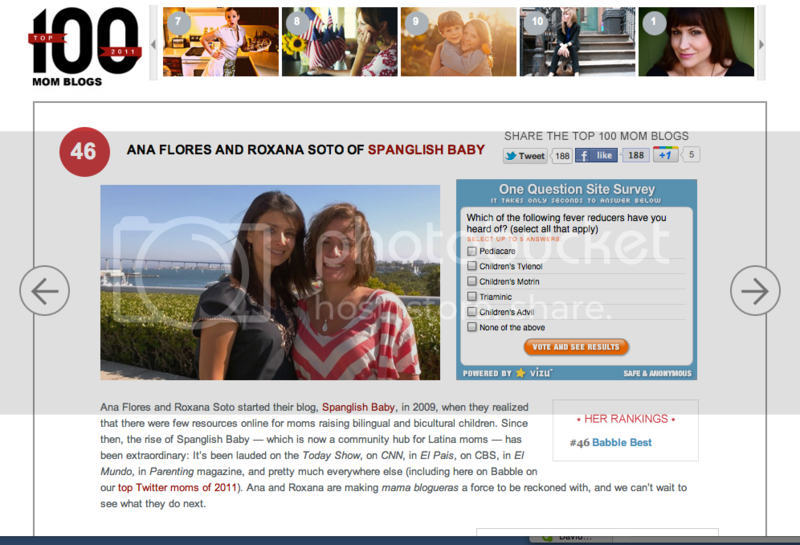 We were given some great news yesterday: SpanglishBaby made it to Babble’s Top 100 Mom Blogs of 2011. We are honored and humbled to end an already blessed year on such a high note. And we have to thank all of you, our supportive community, for all the accolades we’ve received. Although the work is hard, your feedback tells us it’s all worth it. Thank you for believing in what we’re doing here and for helping us grow into such a welcoming community for all those who are raising bilingual and bicultural children. But most of all, we’d like to take this moment to honor all the wonderful women without whom SpanglishBaby wouldn’t be what it is: our smart, engaged and totally dedicated contributors! Gracias chicas from the bottom of our hearts! In fact, when you click on SpanglishBaby – #46 on Babble’s Top 100 list – you’ll see that under our favorite post this year we chose one from our very own contributor, Vanessa of De Su Mama. Her super personal post The Promise I Made To Raise My Daughter Bilingual was about how Vanessa’s abuelo made her promise to teach her daughter Spanish right before he passed away. The post was heartbreakingly beautiful, but it also touched many of us because although we might have not made a similar promise, raising bilingual children is a matter of family and connection to our past and those we hold dear and near to our heart. ¡Gracias Vanessa! The best part about our contributors is that each of them brings something completely different to this community. They each have a very distinct story to tell and they all come from different backgrounds. — Chelsea, our Book Editor, who for the past few months has been compiling really awesome lists of bilingual and Spanish books for our children, writing reviews and posts about literacy that we have all been loving. — Elsie who has delighted us all with her beautiful writing, provocative posts and touching poetry. You can also find her in her own blog, Mama Feminista. — Susan who’s raising two trilingual boys (Spanish/German/English) using the OPOL method and this year spent several weeks in my home country, Peru, immersing her children in Spanish. Oh, and did I mention Spanish is NOT her fist language? We’re in awe of her. — Suzanne another mom raising a trilingual baby (Spanish/French/English) and has been taking us through the process since before her daughter was born and she was researching the best ways to do it. Her daughter is a lucky little girl! You can find Susan blogging in her own space at Interpretations of a Bilingual Life. — Kim who has shared with us many a personal post about raising her twin boys, who have special needs, bilingual. In doing so, she has showed us that the myths surrounding this issue and bilingualism are just that, myths. We appreciate her candor. — Tracy, our features writer extraordinaire and the mastermind behind the hilarious and extremely well-written Latinaish. She always, always comes through no matter what we throw her way! — Ruby, of Growing Up Blackxican, a super talented mother of two who recently joined us and has been showering us with beautiful and not too complicated (thanks!) activities for our bilingual niños. Congrats on your success! Thanks for all of the valuable info. and fun articles. I just love the site and all of the different voices and experiences represented. Gracias a ustedes! You two are amazingly talented. You are inspiring mothers, entrepreneurs, women, and friends. The community you have grown here benefits so so many and I am so proud to be a small part of it. Oh. no. You are a HUGE part of it! Thank you so much Ana & Roxana! You ladies keep me going in thinking outside the box. Very, very happy and honored to be part of this group. Felicitaciones! Estos son uno de muchos logros que vendrán por tan ardua labor! Felicidades Ana & Roxana. So well-deserved! So, so, well-deserved. You’ve changed a lot of lives with what you’ve created here. Knowing there are others on this bilingual/bicultural journey has helped our family keep going, even when things got frustrating, (and has given me a place to find others to laugh with when the inevitable craziness occurs!) – You are helping parents give the most wonderful gift to their children. May SpanglishBaby be alive and well 20 years from now so that those children can come here and thank you themselves. So proud and excited for all of SpanglishBaby’s success! I’m especially honored to be apart of such a great team, led by two remarkable women. Congratulations! Felicidades! By far, my favorite and most useful! YAY! How exciting! Well deserved!!! !